Human Dimensions is the in-house biannual magazine of the United Nations University International Human Dimensions Programme on Global Environmental Change (UNU-IHDP). As part of each issue of Human Dimensions, UNU-IHDP invites young scholars to participate in a topical writing contest. For the second issue, published in January 2013, the contest theme was the ‘human dimensions of biodiversity and ecosystem services’. The following article is the third place entry, published in the issue: House of Cards: The perilous state of global biodiversity. What’s on your dinner plate tonight? For a growing number of people living in tropical forest regions, the answer is often in their own back yard: bushmeat. 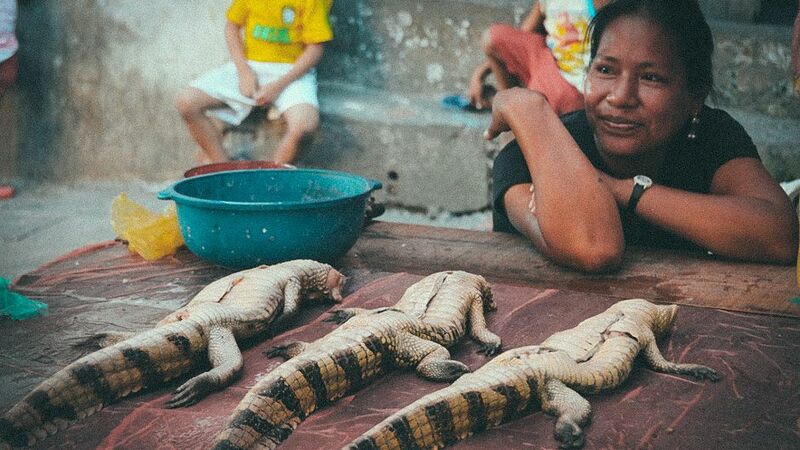 Whether dictated by poverty or cultural preference, wild animal meat is increasingly becoming a dietary staple in the developing world, to the detriment of animal populations and their broader ecological communities. The loss of certain game animals can have cascading effects on plant reproduction and community dynamics, fundamentally altering biodiversity and ecosystem services. And unlike more outwardly destructive human pressures, hunting is difficult to quantify and even more difficult to regulate. Despite the occasional bit of protective legislation, hunting restrictions are rarely enforced, owing to a lack of resources or simple apathy. Governments are not entirely to blame, nor are the hunters or bushmeat consumers themselves; how do you justify halting a practice that puts food on the table where otherwise the plate is left empty? Tourists landing in Puerto Maldonado, Peru, face a dizzying array of ecological adventures, from chic resorts to rustic riverside huts. Most choose whichever offers them the easiest trip — get in, see the rainforest, get out. An hour downriver in a speedboat and they’ve reached the prototypical “jungle”: vines entangle neighbouring palms, colourful songbirds peek out from green walls, and the interminable insect noise makes the forest seem positively alive. Around every trail corner is another group of tiny and impossibly cute tamarin monkeys, leaping from trunk to trunk. The tourists are awed, but unaware. A more trained observer might note the complete lack of large primates — no spider monkeys, no howlers and only a few scattered capuchins. In fact there are no large animals at all, having been lost to local extinction by subsistence hunters. Also lost are the ecological interactions in which these species played a starring role. Expanding human populations place an unprecedented burden on the natural systems that surround them. Though this forest placates the needs of the casual tourist, it is but a remnant of its former glory. Hunting universally accompanies forest exploitation, with direct and indirect effects. Given the high selectivity of hunters for both subsistence and the commercial bushmeat trade, these pressures can significantly reduce and in some cases even eliminate certain local fauna. Large frugivorous (fruit-eating) primates are often targeted for easy detectability and a large meat pay-off; given high densities, gregarious social structure and physical size, these animals are prized prey for human hunters. In Peru, spider monkeys are the first to go, leaving smaller counterparts in their place. Hunter preference can vary based on several factors, including cultural taboos, but the strongest determinant of preference is large body size. Given this size selectivity, large game vertebrates may be drastically reduced at hunted sites while undesirable species, like tamarins, are left untouched. In addition to altering wildlife population structure, hunting can have broader effects on the forest community as a whole. Vertebrate fauna contribute substantially to the maintenance of biodiversity and ecosystem processes — most notably through the dispersal of seeds by fruit-eating species — and their loss may have disastrous consequences both to biodiversity and to the human populations that rely on ecosystem health and functioning. Vertebrate frugivores such as large monkeys play a crucial role in the recruitment of seedlings (forming the next generation of trees) by consuming fruits and spitting or defecating seeds away from the parent plant. In the absence of animal seed dispersers, seeds mostly drop straight down and are subject to dramatically reduced success rates. The majority of these seeds face reproductive failure due to the presence of host-specific predators, pathogens and parasites; these actors are collectively termed “natural enemies,” predominantly arthropods, fungi and other small organisms. Given an abundance of their food of choice, these tiny natural enemies occur at very high densities close to adult trees and destroy nearly all viable seeds. As such, seeds must escape in space from the parent tree to avoid these localized pressures, and seed dispersal by vertebrate fauna is the primary mechanism through which this is possible. When seed dispersers like monkeys are lost due to hunting, many tree species reliant on them are unable to reproduce. In this regard, human hunting pressures indirectly affect forest regeneration by halting the recruitment of new trees, thus reducing diversity and reshaping forest structure. The end result is a proliferation of so-called “empty forests,” devoid of the complexity and ecological activity that once defined them. Tourists and governments alike often see a standing forest as a healthy one, but the differences are stark. The forests surrounding Puerto Maldonado may already be past the point of no return, with cascading interactions that re-shape their physical and biological composition. As ecosystem health directly affects the people dependent on these natural systems, hunting poses a threat both to a forest’s biodiversity and its human inhabitants. Developing a comprehensive strategy for forest use and conservation is critical for the long-term well-being of local communities, though the issue is not entirely black and white. Wild game can be a major source of dietary calories for subsistence hunters throughout the developing world. In tropical forest localities, the estimated carrying capacity for humans dependent exclusively on wildlife for protein may be as low as 1 person/km2, though population densities exceed this nearly everywhere across the tropics. Iron deficiencies and anaemia are common, owing to a lack of suitable dietary protein. Domestic animal meat may be unavailable or prohibitively expensive, which leaves few options but to resort to hunting, legal or otherwise. Given the rapid and dramatic loss of preferred game species in forests subject to hunting pressure, even mild or short-lived hunting may have long-term ecological effects. Many large game vertebrates are additionally vulnerable to major population declines, given their long life histories and low reproductive capacity. Large primates in particular take several years to reach reproductive age and then are subject to long interbirth intervals and extended nursing periods. While seemingly necessary for human health, subsistence hunting is thus almost certainly unsustainable wherever it occurs. Unfortunately, hunting for subsistence is only one side of the coin. Commercial bushmeat markets are growing to meet cultural demand for wild animal protein, especially in Africa. City dwellers long for the foods they grew up with, from elephant steaks to gorilla stew. And a durable trade in fetishes — animals or natural products believed to hold powerful magic that can help people — caters to wealthy and privileged classes. Despite the availability of domestic animal meat, people who can afford to buy bushmeat and other animal products will do so readily, especially on holidays and special occasions. Commercial markets promote exploitation in even the most remote uninhabited forests; international logging operations provide the necessary transportation infrastructure — willingly or not — through road construction and smuggling on timber rigs. Ultimately, where there exists demand and opportunity for hunting wild animals, tropical forests will suffer. While the conservation needs are clear, the solutions are not. In order to reduce the deleterious effects of hunting, conservation measures must focus on some combination of formal government protection and personal incentives to shift hunting pressures away from the most vulnerable species. Government designated conservation areas may be the best approach in strictly limiting hunting impacts. However, in many cases protected areas are small, insufficiently supported or poorly designed, offering little or no real protection. Small conservation zones near Puerto Maldonado, Peru are strictly protected but still lose their large fauna simply because they venture beyond the safe limits. This highlights the need for large conservation zones with protected core areas, which may be possible only through a network of megareserves, each greater than one million hectares in size. New protected areas could be created — and existing ones modified — which enhance “passive defensibility” by encompassing entire watersheds, thus naturally reducing hunters’ access by rivers and roads. Nonetheless, no protected area strategy will completely halt hunting practices when the need for bushmeat remains. Another possible approach involves the implementation of education initiatives, in order to raise awareness for the ecosystem-level effects of hunting large frugivores. Targeted hunting of these species will effectively reduce the future persistence of large-fruited trees, which may themselves be important to the diets of local people. Rare-to-occasional hunting may be sustainable in localized areas, given the influx of immigrating animals from non-hunted populations nearby, though there is currently no impetus to reduce hunting to this level. Shifts toward more highly fecund species may also lift some of the burden away from hunted primates. However, hunting of these species may have broader negative effects of their own. Though the practice of hunting is clearly detrimental in the long term, understanding this fact will do nothing to sway local people without access to bushmeat alternatives. Food production and distribution is lacking across much of the tropics, despite the relative plethora in the United States and elsewhere. Conventional wisdom says that simply applying improved agricultural practices will bring our worlds together. But what works in developed temperate nations does not always work in the tropics, where soils are comparatively destitute of nutrients, limiting agricultural productivity even with improved farming practices and mechanization. What’s more, large-scale agriculture nearly always goes hand-in-hand with forest loss and the degradation of ecosystem services. Puerto Maldonado could not possibly support its rapidly growing population without doing considerable harm to the surrounding forests. Perhaps most important for people of tropical forests is access to sufficient dietary protein and associated nutrients such as iron. Raising animals in the tropics is problematic, however, given a general lack of husbandry knowledge and the high prevalence of pathogens and parasites. Improving agriculture and domestic animal husbandry practices will no doubt reduce reliance on wild game, but the path to achieving this goal is uncertain. In addressing the bushmeat crisis, there is no silver bullet. More holistic conservation initiatives are now combining biodiversity-based approaches such as education, land use planning and hunting restrictions, with food-based ones, like improved domestic animal husbandry, veterinary care and agricultural advances. Localized efforts foster change at the community level, while larger conservation groups partner with international logging corporations to limit their hunting-related impacts. Ultimately, the people who depend on hunting for their livelihood are those with the most to lose when conservation efforts fail, though they are often the least equipped to make necessary changes on their own. The local guides of Puerto Maldonado’s eco-lodges are aware that hunting has stripped their forests of charismatic fauna, yet they are unable to do anything about it. A multi-faceted approach has never been more warranted in conservation; the complexities of the hunting problem demand creativity, foresight and cooperation. The only lasting solutions will be those that address both local food insecurities and the biological integrity of the forest. Such solutions must exist, however, for humans possess far too much ingenuity to be stumped by a problem like this. Puerto Maldonado is not a special case. Hunting occurs across the planet’s tropical forests, with long-term consequences. The targeted hunting of large seed-dispersing animals in particular can fundamentally alter forest dynamics and ecosystem processes. Such losses result in expansive changes to tropical forest community composition and biodiversity. As an ecosystem’s integrity degrades, so too do the services it provides. Though hunting is in many cases a necessity for local people, it is an unsustainable and ultimately detrimental practice to their well-being. Conservation solutions must include a more holistic mix of biodiversity-based approaches with food-based ones, but to date, none have sufficiently addressed this crisis. Without effective conservation action, local people will suffer, and unabated hunting pressures will continue to diminish the integrity and wonder of tropical forests now and into the foreseeable future. This article appears courtesy of Human Dimensions magazine and UNU-IHDP. Hunting for a Solution by Cooper Rosin is licensed under a Creative Commons Attribution-NonCommercial-ShareAlike 3.0 Unported License. Cooper Rosin grew up loving the sciences. His first exposure to the wonder of tropical forests was during a semester abroad in Ecuador, where he studied ecology and conservation. After several more years in research, teaching, living and working in the New World tropics he enrolled in the Masters of Environmental Management at Duke University, where he is currently working towards a PhD in Ecosystem Science and Management. He hopes to continue pursuing conservation-oriented research in order to understand the human impacts on biodiversity and ecological integrity in tropical forests.